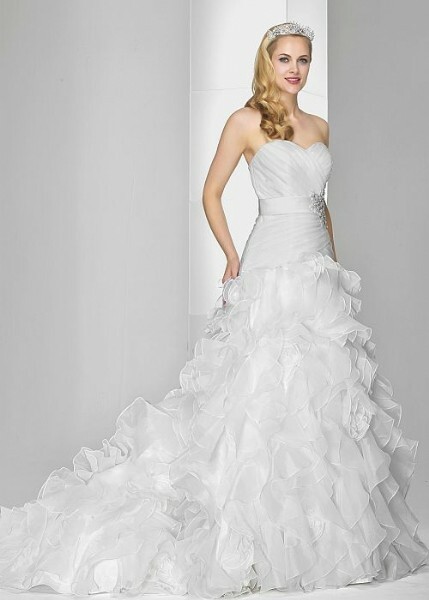 Stand out from the crowd this season with this gorgeous strapless organza gown with drop waist. Presented in a classic and flattering drop down silhouette, this gown gives a classic edge. Pleated cross over bodice with a band and bead detail with organza ruffle skirt. I am selling this brand new wedding dress, which is now unfortunately no longer required. Still in the original box and packaging and never been unwrapped or worn. Once you send a message, Elaine can invite you to purchase the dress.